Bioknoppix was a customised distribution of the KNOPPIX live CD. With this distribution you just boot from the CD and you have a fully functional Linux OS with open source applications targeted at the molecular biologist. 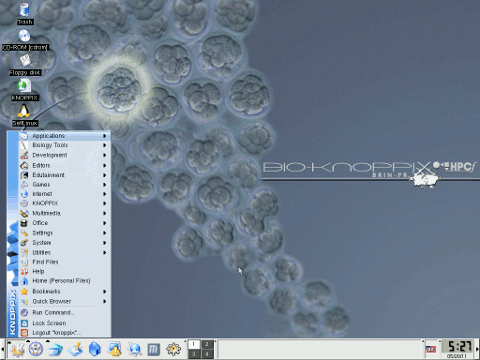 Besides using some RAM, Bioknoppix doesn't touch the host computer, being ideal for demonstrations, molecular biology students, workshops, etc. Rate this project Johnny Hughes has announced the release of CentOS 6.6, un updated build of the project's legacy branch, compiled from the source code for Red Hat Enterprise Linux 6.6: "We are pleased to announce the immediate availability of CentOS 6.6 install media for i386 and x86_64 architectures. CentOS 6.6 is based on source code released by Red Hat, Inc. for Red Hat Enterprise Linux. There are many fundamental changes in this release, compared with the past CentOS 6 releases, and we highly recommend everyone study the upstream release notes as well as the upstream technical notes about the changes and how they might impact your installation. All updates since the upstream 6.6 release are also on the CentOS 6.6 mirrors as zero day updates. When installing CentOS 6.6 (or any other version) from any of our media, you should always run 'yum update' after the install." See the release announcement and release notes for detailed information about this version. Download (mirror list): CentOS-6.6-x86_64-bin-DVD1.iso (4,418MB, SHA256, torrent, pkglist). CentOS 6.6 live CD/DVD images were not available at the time of announcement. CentOS as a group is a community of open source contributors and users. Typical CentOS users are organisations and individuals that do not need strong commercial support in order to achieve successful operation. CentOS is 100% compatible rebuild of the Red Hat Enterprise Linux, in full compliance with Red Hat's redistribution requirements. CentOS is for people who need an enterprise class operating system stability without the cost of certification and support. Karanbir Singh has announced the release of CentOS 7-1810, the latest update in the CentOS 7 series, built from the source code of Red Hat Enterprise Linux 7.6: "We are pleased to announce the general availability of CentOS Linux 7 (1810) for the x86_64 architecture. Effective immediately, this is the current release for CentOS Linux 7 and is tagged as 1810, derived from Red Hat Enterprise Linux 7.6 source code. Updates released since the upstream release are all posted, across all architectures. We strongly recommend every user apply all updates, including the content released today, on your existing CentOS Linux 7 machine by just running 'yum update'. As with all CentOS Linux 7 components, this release was built from sources hosted at git.centos.org. In addition, SRPMs that are a byproduct of the build (and also considered critical in the code and buildsys process) are being published to match every binary RPM we release." See the release announcement and release notes for further information. Download links (SHA256, signature, pkglist): CentOS-7-x86_64-DVD-1810.iso (4,376MB, torrent), CentOS-7-x86_64-Minimal-1810.iso (918MB, torrent), CentOS-7-x86_64-NetInstall-1810.iso (507MB, torrent), CentOS-7-x86_64-LiveGNOME-1810.iso (1,406MB, torrent), CentOS-7-x86_64-LiveKDE-1804.iso (1,859MB, torrent). CentOS is a Linux distribution based on the source code from Red Hat Enterprise Linux. The project's latest version, CentOS 6.10, offers an update to the project's 6.x series and includes mostly bug fixes along with a few minor upgrades. "We are pleased to announce the immediate availability of CentOS Linux 6.10 and install media for i386 and x86_64 architectures. There are various changes in this release, compared with the past CentOS Linux 6 releases, and we highly recommend everyone study the upstream Release Notes as well as the upstream Technical Notes about the changes and how they might impact your installation. All updates since the upstream 6.10 release are also on the CentOS mirrors as zero day updates. When installing CentOS-6.10 (or any other version) from any of our media, you should always run 'yum update' after the install to apply these. Users consuming our CentOS-CR repositories will already be running most of the packages that make up CentOS 6.10 and all updates released since." More information can be found in the project's release announcement and in the release notes. Download (SHA256, signature, pkglist): CentOS-6.10-x86_64-bin-DVD1.iso (3,807, torrent), CentOS-6.10-x86_64-LiveDVD.iso (1,947MB, torrent), CentOS-6.10-x86_64-netinstall.iso (229MB, torrent). Karanbir Singh has announced the release of CentOS 7-1804, the latest update in the CentOS 7 series. The new release is based on Red Hat Enterprise Linux 7.5 and includes several bug fixes. "I am pleased to announce the general availability of CentOS Linux 7 (1804) for across all architectures. Effectively immediately, this is the current release for CentOS Linux 7 and is tagged as 1804, derived from Red Hat Enterprise Linux 7.5 As always, read through the release notes - these notes contain important information about the release and details about some of the content inside the release from the CentOS QA team. These notes are updated constantly to include issues and incorporate feedback from the users." Further information on CentOS 7-1804 and its supported architectures can be found in the release announcement. 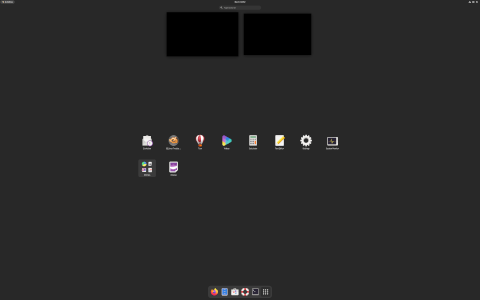 Download (pkglist): CentOS-7-x86_64-DVD-1804.iso (4,263MB, SHA256), CentOS-7-x86_64-Everything-1804.iso (8,962MB, SHA256), CentOS-7-x86_64-NetInstall-1804.iso (495MB, SHA256), CentOS-7-x86_64-LiveGNOME-1804.iso (1,324MB, SHA256), CentOS-7-x86_64-LiveKDE-1804.iso (1,803MB, SHA256). CentOS is a distribution built from the source code of Red Hat Enterprise Linux. The CentOS project has announced the availability of a new update to the distribution, releasing CentOS 7-1708 which is derived from Red Hat Enterprise Linux 7.4. The list of changes in this update to version 7 is fairly conservative: "Since release 1503 CentOS 7 can report bugs directly to bugs.centos.org. You can find information about that feature at this page. Various new packages include among others: python-gssapi, python-netifaces, mod_auth_openidc, Pidgin and Qt 5. SSH1 support has been removed from the SSH server. Along with this move, all cryptographic protocols and algorithms which are considered insecure have been deprecated. OpenSSL now supports DTLS (TLS via UDP) and ALPN. NVMe Over Fabric is now supported in the NVM Express kernel driver. There have been various changes and enhancements to cryptographic abilities of various packages - Sendmail now supports ECDHE, OpenSSH now uses SHA2 for public key signatures, among others." The release announcement and release notes contain further information. Download (pkglist): CentOS-7-x86_64-DVD-1708.iso (4,312MB, SHA256, signature, torrent), CentOS-7-x86_64-NetInstall-1708.iso (422MB, SHA256, signature, torrent). Johnny Hughes has announced the release of CentOS 6.9, a Red Hat-sponsored Linux distribution built from the source code for the recently-released Red Hat Enterprise Linux (RHEL) 6.9. This is the project's legacy branch supported until November 2020. From the release announcement: "We are pleased to announce the immediate availability of CentOS Linux 6.9 and install media for i386 and x86_64 architectures. CentOS Linux 6.9 is derived from source code released by Red Hat, Inc. for Red Hat Enterprise Linux 6.9. All upstream variants have been placed into one combined repository to make it easier for end users. Workstation, server and minimal installs can all be done from our combined repository. There are many fundamental changes in this release, compared with the past CentOS Linux 6 releases, and we highly recommend everyone study the upstream release notes as well as the upstream technical notes about the changes and how they might impact your installation." See also the release notes for further information and upgrade instructions. Download links (SHA256, signature, pkglist, mirror list): CentOS-6.9-x86_64-bin-DVD1.iso (3,788MB, torrent), CentOS-6.9-x86_64-LiveDVD.iso (1,930MB, torrent), CentOS-6.9-x86_64-minimal.iso (408MB, torrent), CentOS-6.9-x86_64-netinstall.iso (230MB, torrent). Karanbir Singh has announced the release of CentOS 7-1611. The new release is derived from Red Hat Enterprise Linux 7.3 and offers a number of new features, including SHA2 support in OpenLDAP, Bluetooth LE and a technology preview of Btrfs. "Since release 1503 (abrt>= 2.1.11-19.el7.centos.0.1) CentOS-7 can report bugs directly to bugs.centos.org. You can find information about that feature at this page. Various new packages include among others: python-gssapi, python-netifaces, mod_auth_openidc, pidgin and Qt5. Support for the 7th-generation Core i3, i5, and i7 Intel processors and I2C on 6th-generation Core Processors has been added. Various packages have been rebased. Some of those are samba, squid, systemd, krb5, gcc-libraries, binutils, gfs-utils, libreoffice, GIMP,SELinux, firewalld, libreswan, tomcat and open-vm-tools..." Further information can be found in the project's release notes. 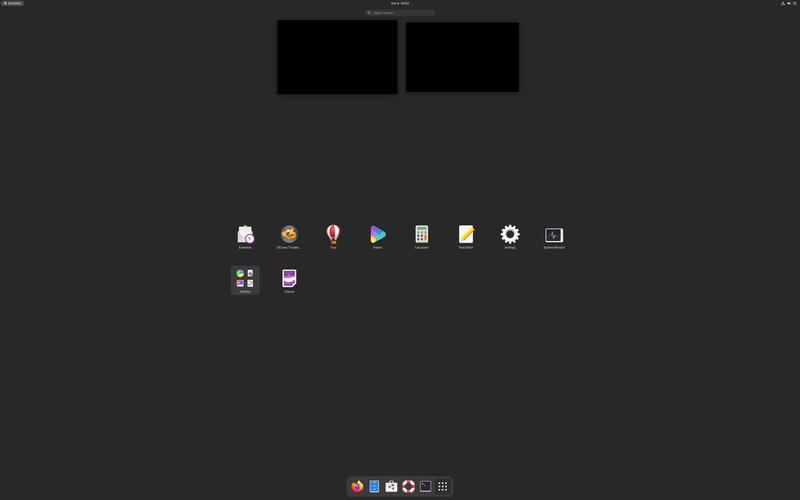 Download (pkglist): CentOS-7-x86_64-DVD-1611.iso (4,177MB, SHA256, signature, torrent), CentOS-7-x86_64-NetInstall-1611.iso (377MB, SHA256, signature, torrent). Johnny Hughes has announced the release of CentOS 6.8, a community distribution which is built using the source code of Red Hat Enterprise Linux. The new release features a number of important changes, including deprecated drivers and packages as well as new features. "CentOS Linux 6.8 is derived from source code released by Red Hat, Inc. for Red Hat Enterprise Linux 6.8. All upstream variants have been placed into one combined repository to make it easier for end users. Workstation, server, and minimal installs can all be done from our combined repository. All of our testing is only done against this combined distribution. There are many fundamental changes in this release, compared with the past CentOS Linux 6 releases, and we highly recommend everyone study the upstream release notes as well as the upstream technical notes about the changes and how they might impact your installation." The release announcement and release notes detail all the changes in CentOS 6.8. Download (SHA256, signature, pkglist): CentOS-6.8-x86_64-bin-DVD1.iso (3,735MB, torrent), CentOS-6.8-x86_64-LiveDVD.iso (1,919MB, torrent), CentOS-6.8-x86_64-netinstall.iso (228MB, torrent). Karanbir Singh has announced the launch of a new version of CentOS. The CentOS project builds an enterprise class distribution based on source code from Red Hat Enterprise Linux. The latest release, CentOS 7-1511, contains mostly minor new features and security fixes. "Since release 1503 (abrt>=2.1.11-19.el7.centos.0.1) CentOS-7 can report bugs directly to bugs.centos.org. You can find information about that feature at this page. sudo is now capable of verifying command checksums. A Kerberos HTTPS proxy is now available for identity management. NSS no longer accepts DH key parameters < 768 nor RSA/DSA certificates with key sizes < 1024 bits. NSS also now enables TLS1.1/1.2 by default. Various packages now support TLS1.1/1.2 and EC ciphers..." Singh reported CentOS developers are working to produce builds for ARM, Aarch64 and 32-bit x86 architectures. Further information can be found in the project's release announcement and in the release notes for CentOS 7-1511. Download: CentOS-7-x86_64-DVD-1511.iso (4,129MB, SHA256, torrent, pkglist). Karanbir Singh has announced the availability of a new release of CentOS, a distribution made from the source code used to create Red Hat Enterprise Linux releases. "CentOS Linux 6.7 is derived from source code released by Red Hat, Inc. for Red Hat Enterprise Linux 6.7. All upstream variants have been placed into one combined repository to make it easier for end users. Workstation, server, and minimal installs can all be done from our combined repository. All of our testing is only done against this combined distribution. There are many fundamental changes in this release, compared with the past CentOS Linux 6 releases, and we highly recommend everyone study the upstream Release Notes as well as the upstream Technical Notes about the changes and how they might impact your installation. (See the 'Further Reading' section if the CentOS release notes). All updates since the upstream 6.7 release are also on the CentOS mirrors as zero day updates. When installing CentOS-6.7 (or any other version) from any of our media, you should always run 'yum update' after the install to apply these." More information on CentOS 6.7 is available in the project's release announcement and in the release notes. Download (SHA256, pkglist)): CentOS-6.7-x86_64-bin-DVD1.iso (3,715MB, torrent), CentOS-6.7-x86_64-netinstall.iso (230MB, torrent).